One of the depressing things about getting old is all the bounce leaks out of you. I look at Arthur, he's packed with bounce, he falls over and springs back up like he's got neoprene skin. I fall over and I have to lie there for a week counting my fractures and trying to remember whether we've made a will. So, after I'd done my bit at the wildfire conference I managed to fall down a couple of steps and twist, strain or bruise my ankle so that today it's stolen and painful, despite my concerted programme of RICEing (Rest. Ice. Compression. Elevation - Dr Internet told me what to do.) I wouldn't normally bother you with this except that in a week's time I'm supposed to be doing the Coast To Coast walk and I'm really looking forward to it and I don't want to miss out because of a stupid slip down a step. 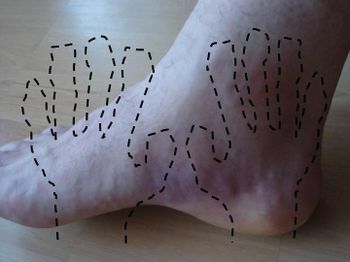 So I'm going to resort to Wayne Rooney / Sun newspaper style tactics and ask you all to lay your hands on the screen and send the healing power of the blogosphere through the internet tubes to my ankle. I will install some sort of vibes reader to manage the inveitable spikes in good will and will update you on healing feelings via twitter. I thank you. that walk looks awesome. and very tough. but awesome. and you end up very near to my parent's place (in Staithes) - it's a beautiful part of the world. I'm having a word with some people my end...about your ankle. I'm sure you'll see an improvement by the morning. 'stolen' for 'swolen' is quite a slip, does it have significance? maybe, maybe I feel that my ankle has been taken from me, and hence my youth and vitality. arnica... buy some arnica salve and massage it in to your ankle. Has helped for many a triathlon sprain - best of luck! I recommend Ibruprofen Gel and physio. Not to be taken with Ibruprofen pills, but if you're not taking those either, get some down you - they're the best for reducing swelling. I prefer the gel as it gets right to the heart of the problem without the lethargy. Drink pineapple juice, it's the natural way of reducing swelliness. I'd say feet up for a week, preferably in an oxygen tent. Feel the love in the room, my friend. Ouch. Looks really nasty. By way of healing, I second Collyn's Arnica suggestion, and am sending widescreen positive vibes. My sympathy. I'm hobbling around town at the moment; my guitar strap broke, sending it straight down onto the joint of one of my toes. well, I'm not doing the whole thing, just from Kirkby Stephen, didn't have time for the whole thing, but you may well still be right. I think if I'm not up for walking I'll take my bike and cycle it. I don't want to just abandon it. As someone who did one ankle (falling off walking boots) then the other (more respectably, falling off wedges) last summer, I know the pain. I hope it recovers very quickly. Now, riding it is a much better idea. So much more civilised than walking. Wishing you a speedy recovery Russell.